The International Crops Research Institute for the Semi-Arid Tropics (ICRISAT), presented its first batch of ethanol made from sweet sorghum as an alternative source of biofuel to Philippine President Gloria Macapagal-Arroyo. William Dar, former minister of the Philippine Department of Agriculture and current director general of the Indian-based ICRISAT, paid Arroyo a courtesy call in the Malacanang Palace to present the group's success in harnessing ethanol from the promising plant whose scientific name is Sorghum bicolor (L.) Moench. 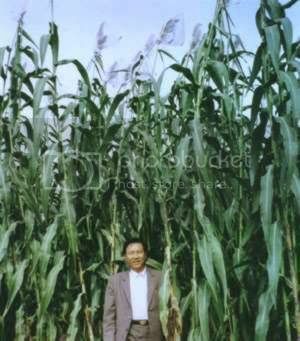 Arroyo lauded the group and vowed to promote sweet sorghum immediately as an alternative feedstock for ethanol production. Sweet sorghum is similar to grain sorghum with the difference that its stalks are very rich in sugar. The plant's main advantage is the efficiency with which it uses water and its capacity to survive in saline soils. This makes sweet sorghum a good alternative feedstock for ethanol production in semi-arid climates and relatively poor soils. Many scientists think that a variety of drought-tolerant and salt-tolerant (tropical) grass species, amongst which sweet sorghum, the "camel among crops" (referring to its survival in dry conditions) could be the key to agricultural development in areas affected by aridity and saline soils. He explained the research institute's sweet sorghum plantation testing center at the Mariano Marcos State University in Batac, Ilocos Norte has responded well to ICRISAT's extraction process and is immediately available for planting in areas where future ethanol distillers may be established. On January 17, Arroyo signed into law Republic Act No. 9367, also known as the "Biofuels Act of 2006," that promotes the use of alternative transport fuels consistent with the Declaration on East Asian Energy Security ratified by the 16 heads of state of the Association of Southeast Asian Nations and its dialog partners during the just-concluded 12th ASEAN Summit in Cebu, Philippines. The Biofuels Act of 2006 seeks to reduce the country's dependence on imported fuels with due regard to the protection of public health, the environment and natural ecosystems consistent with the country's sustainable economic growth that would expand opportunities for livelihood. The Act mandates the use of biofuels as a measure to develop and utilize indigenous renewable and sustainably-sourced clean energy sources to reduce dependence on imported oil.